When generating documentation using XML documentation comments, properties can be described using the standard summary tag. They should also include the value tag, which describes the value held in the property. As we've seen in early articles, types and their members can be described using XML documentation comments. These comments can then be compiled into help files that explain the usage of your code libraries. One of the more commonly used tags is summary. It can be applied to classes, structures and all of their constituent members. The tag is used to provide a description of the item and, once compiled into a help file, the summary is the first text seen on a help page. When you are documenting a property, another tag can be used to provide additional information about the value that a property returns, or that you can set in write-only properties. This is the value tag. When included in a help file built with Sandcastle, the information from the value tag appears beneath the syntax of the property. We can demonstrate this with a sample property, as in the following code. Here the summary describes the usage of the property and the value tag describes the value in its field. /// Provides a queue of any type. Items can be assigned a priority. /// Gets or sets the number of items that can be held in the queue. 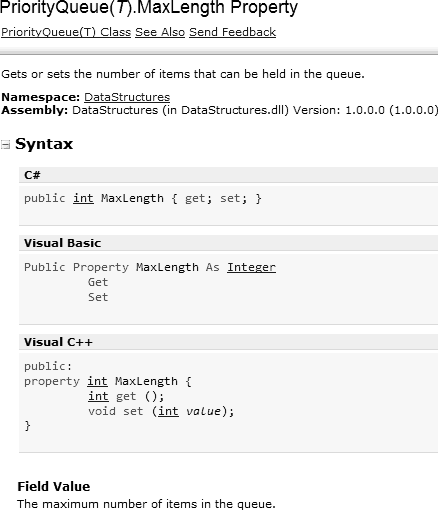 If you compile a help file for the above code, the page for the MaxLength property appears as follows. Note the Field Value section, which contains the information from the value tag.